Which Guitar Speaker is Right for Me?! In the world of electric guitar, there sure is a lot of talk about "tone." Whether the subject of tone revolves around guitar choice, effects pedals or even what kind of amplifier, at the end of the day the speakers are what's translating all of that information to the ears. Now that's not to say that your speakers are the most important investment in your tone. If you ask us, we think it's probably your amp selection. One thing we think everyone can agree on though is that the lowly guitar speaker often gets overlooked in the proverbial "quest for tone". So what type of speaker is right for your tone? With so many speaker manufacturers and so many different speaker voicings, the options can certainly be nothing short of overwhelming. We thought we would take a minute here to talk about a couple different fundamental styles of guitar tones, and show you some resources we found helpful in finding just the right guitar speaker. While the differences between ceramic and AlNiCo speakers are certainly substantial, we want to focus on the crux of the electric guitar tone; the tube amplifier. With that said, there are essentially two pedigrees of tube amplifier: the "British" sound and the "American" sound. We want to break it down from a standpoint of speaker manufacturers, and the roles these brands have played in British and American guitar tones. British amplifiers seem to have subtleties in their tones that American amps simply do not possess. Throughout the years these tones have been characterized as "chimey" "bell-like" and "crunchy"; terms that are now synonymous with great guitar tone. A short list of iconic British amp manufacturers are certainly responsible for creating these complex tones, but a large part of this equation has also been Celestion's role in helping to create the famous tones of the 1960's and 70's. As a result, Celestion has also become speaker of choice for almost any British amp worth its salt. Amps like Marshall's, Vox's and Orange's have produced legendary tones that Celestions has also been a part. This video shows the different characteristics of some of Celestion's most iconic speakers. Check it out and hear them for yourself. Now let's come back to the States and get a little insight into the country that started the electric guitar craze. American amplifiers, unlike British amps, tend to have warmer, more-robust, punchier tones. These American amps tend to carry a lot more power than their British counterparts. Ironically, with more power comes more "headroom" or clean gain before the amp will distort. As a result, the iconic American amps of the 1950's and 60's were incredibly clean, incredibly clear and incredibly LOUD! With such high outputs, amp manufactures like Fender and Ampeg relied on heavy-duty speakers that could handle the power and produce their signature tones at very high levels. Speaker manufactures like JBL, Jensen, Eminence and Electro-Voice have have cemented their names as staples in many iconic American amplifiers. While Celestion seems to have cornered the market in British amps, having such a wide variety of choices in American-style speakers has created quite a wide palette of speaker tones, with each speaker manufacturer imparting their own unique take of what true "American" tone should be. 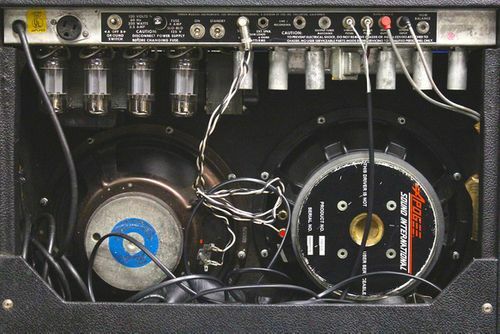 Check out this great site all about the different American-style speakers, and how they have shaped the tone of Fender amplifiers. We hope that you've enjoyed this little exploration into the world of guitar speakers and the role that they play in helping to define guitar tone. At the end of the day however, your guitar tone is just that...YOUR OWN. With that said, there really are no rules in your quest for tone. If you are looking for some first-hand experience with some of this gear, check out our backline rental page and contact us anytime for more information about any of the gear you see there!